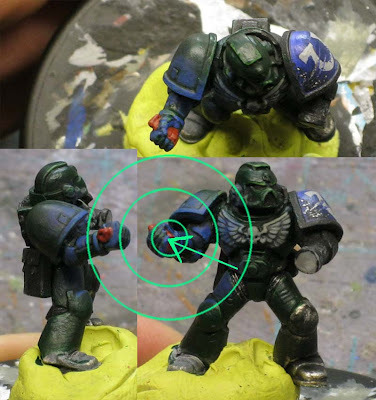 As part of the spiraling out of control series on OSL, this one looks at taking your glowing object and applying the radiant light to the rest of your model and putting it all together. Again, a huge thanks goes out to the guys who allowed me to use their images in this one, Red's Corps and Crosser Modeling. 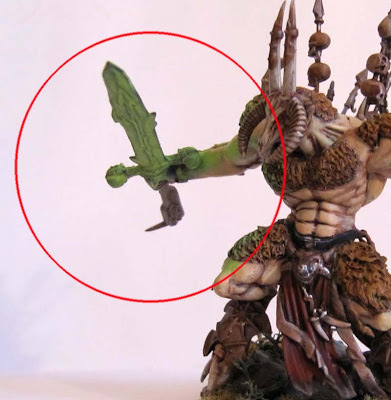 The idea here is to teach people how to do more accurately portray this effect and not to pick on folks for sharing what they've done on their models. Thanks for sharing your work guys, I genuinely appreciate it! This is going to be a very long post, so let's get to it. 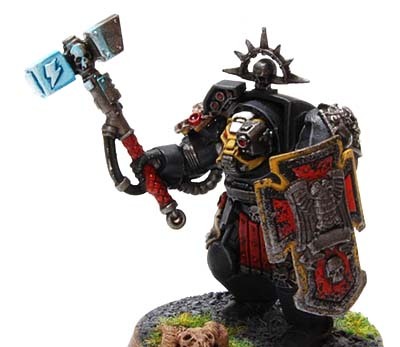 Our first example comes by way of Red who sent me the link to his terminator at the top and asked what I thought about the OSL effect. 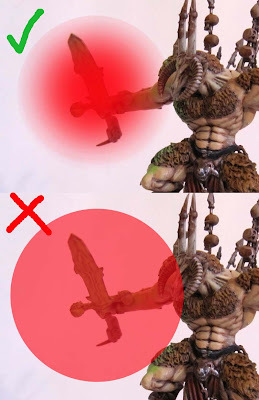 Red wanted to make sure the effect did not extend to the model itself since he's magnetized the arms and wants to be able to swap them out without having to worry about how they are painted. This is easy enough to do, as we just have to make sure our radiant light doesn't travel that far. 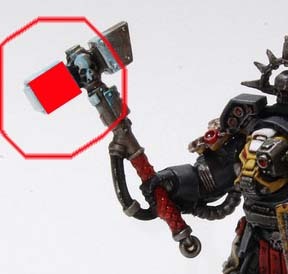 If we take a close look at the thunderhammer, we notice the distance the radiant light travels outward is not consistent on the hammer. While not exactly a deal breaker, it's enough that even the untrained eye might look at it and think something is wrong. Red has the effect correct so far, he just hasn't finished it off. The glowing element actually looks like it's glowing and he's hit all the right surfaces... just not all of them. If we imagine the glowing element to be the head of the hammer (the red square), then the glowing radius would extend out to the red line around it if we measure to his furthest application of light. 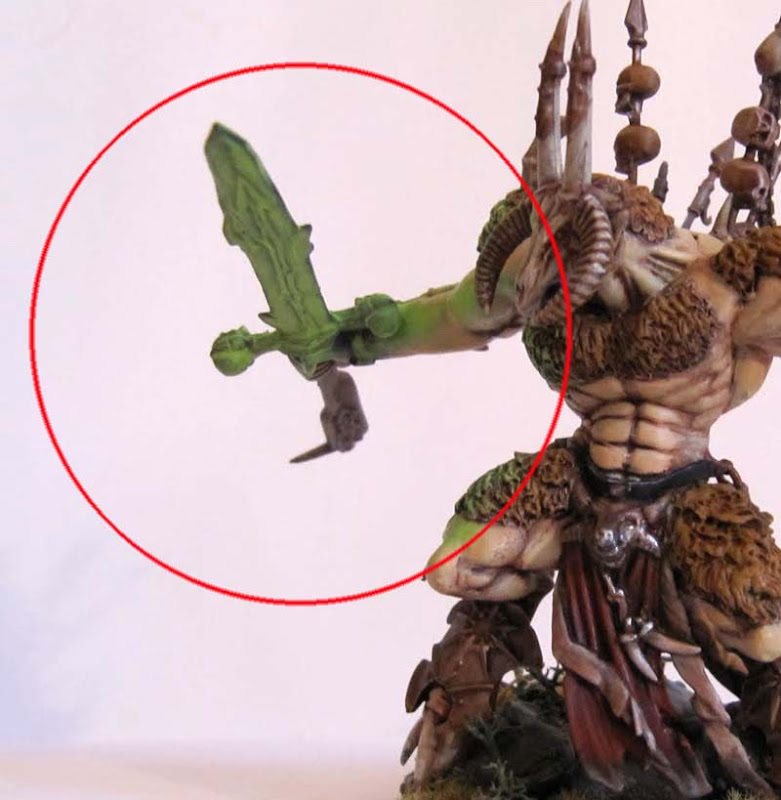 You can see that some areas on the handle of the weapon should be getting radiant light that are not. Here I've taken his photo and added in the rest of the lighting on the thunderhamer. I've covered all the areas that should be covered within the radius of the radiant light. Now, let me add this little tidbit... since we're adding radiant light to shiny metal here, I went in and added a slight edge highlight to the connection point where the black power cable plugs into the handle above the grip. The pic doesn't show it that well unfortunately. This would be a case by case thing. Since we have a highly reflective surface, it might not hurt to make sure you have some edge highlights to reinforce the effect. Nothing crazy, in fact, subtle is best here. 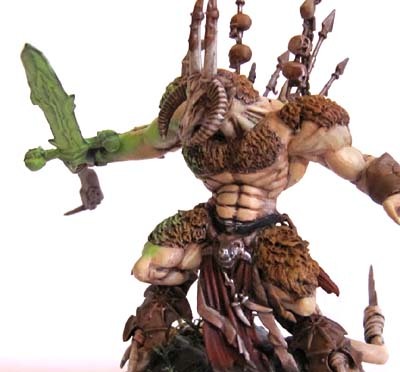 Our next example comes from Crosser Modeling when he posted his converted Vermin Lord. Let's take a look at what we've got here. The first thing we do is check to see if the radiant light is consistent. This example differs from the previous one in that the radiant light is reaching the model and actually touches on a good portion of it. This would mean we have a strong light source and have to adjust our lighting appropriately. After looking at where the glow would fall, this one comes fairly close to being accurate, A few minor places were missed, but most of the correct surfaces are lit. And the effect is much more convincing because of this. But we fall short of truly being convincing here. As the radiant light from our source travels away from it's origin, it gets weaker or less intense... (like the top example). By the time we reach the maximum distance we want our light to travel, it's barely visible. To represent this, we need to blend our radiant light onto our surface and not just paint it straight on there at the same consistency (like the bottom example). If we look closer at our example, we notice the nice blending along the edge of the light and the surface, but the light is the same intensity all over. The trouble is, it's just as bright on the hand as it is on the thigh that is further away from the glowing source. And, you have to think about the light itself. If it's strong enough to radiate that far away from the origin, it won't be stopping abruptly at a well defined edge, it will be gradually blending and fading away (like our correct example in the previous photo above). Again, another good attempt that just needs some fine tuning to really work. 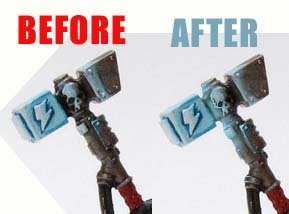 Red's thunderhammer example also suffered a bit from this... having a super sharp defined edge to his radiant light. So I figured I would do an example to show you all what I mean when I talk about applying the radiant light to surrounding surfaces. 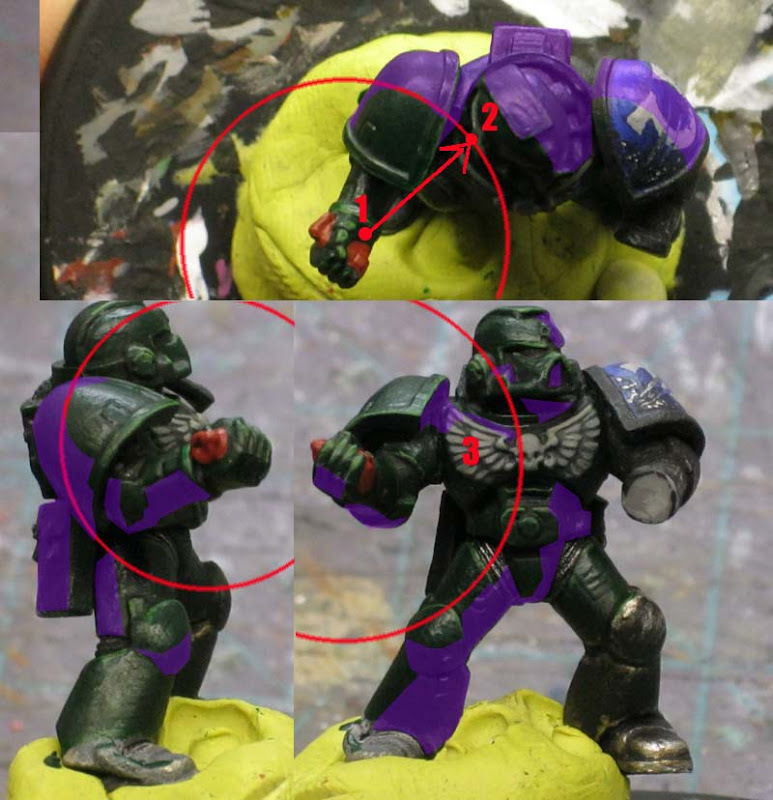 It was requested that I paint the armour Dark Angles green to show how light might play off the surface. I love Dark Angels so that was no problem. 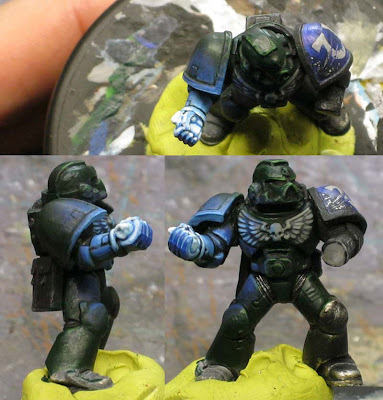 For my example, I took a regular Marine I had lying around that was holding a grenade and decided to make that my glowing object. I've planned out my radiant light radius on the model along with mapping the areas the radiant light will NOT fall (the purple areas). I've included three views of the model so you can see how the light falls from a few different directions. Again, keeping in mind the radiant light will become weaker the further it travels away from the origin, the brightness of the light will not be that same at Spot #1 as it will be at Spot #2.The grenade is painted red right now to show the origin, but I'll fix that later on. 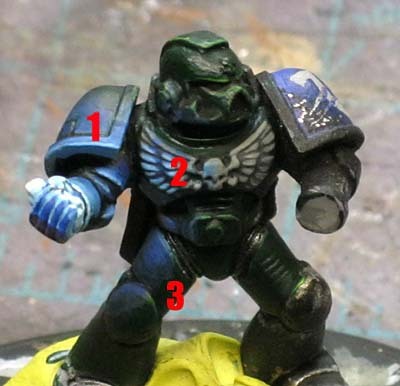 If you notice Spot #3, it's important because it is an area on the model that is much lighter than the dark green armour that surrounds it. While the lighting will be consistent in that range on the model, it will have a different effect on the light grey surface than it will on the dark green surface next to it. When I talk about how the radiant light weakens as it moves out from the origin, imagine a series of spheres around your glowing object... the smaller the sphere, the brighter the radiant light in it. In this picture, I've started to map out where my radiant light will go. I've thinned down my paint and added just a little bit of lighting effect at the outer most edges while increasing the effect as I get closer to the origin. And by the magic of the internet, the finished model. As I kept adding more radiant light, I kept making it brighter the closer I came to the glowing object itself (the grenade). And just a few points to make about this example and things to keep in mind when you try your hand at it yourself. 1. As I got closer to the origin, I highlighted the very edges facing the source itself as a way to reinforce the effect. Not always applicable and if you do use it, keep it subtle... bu it's one trick to making the effect believable. 2. The radiant light on the light grey chest eagle is slightly lighter than the radiant light on the dark green armour next to it. The radiant light is not stronger or weaker, just a bit lighter to reinforce the difference in base colors. As you get closer to the origin or the glowing object itself, any differences in surrounding colors becomes less evident since the radiant light is so strong at that close of a distance. That's why the armour is not dark green at all on his hand and wrist, but bright blue like the radiant light itself. 3. Being as far away as his leg is (just at the edge of my radiant light radius), there is no well defined edge to the radiant light... it just fades away. Same goes for the helmet just on the edge of my radius, the lighting effect there is very subtle compared to the underside of his forearm that is holding the grenade. Since it is right there next to the origin, the difference between lighted areas and not lighted areas is well defined since the radiant light is so bright that close to the object itself. I added this guy to show you what a smaller light source might look like. While it's fairly bright (the brightness of the glowing element), it's not very big and doesn't project radiant light out very far at all. I hope this last article helps finish off the series and explain anything missed in the previous two posts. Again, I want to thank the guys who allowed me to pick apart their work and put it on display so everyone else could learn from it. 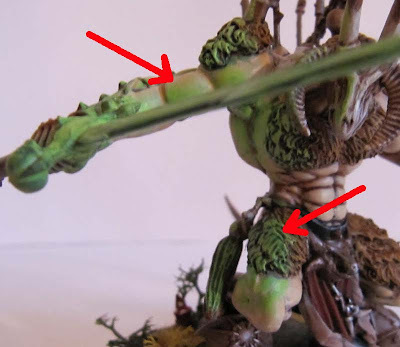 There is one more OSL post that touches on some common pitfalls that's worth looking at real quick just to reinforce some of the concepts covered in these last few posts. If I've missed anything or you've got questions, fire away. If It takes another post to touch on some exceptions to the rule, then we'll do it. Thanks a lot for your part three, its gone a long way to helping me develop my OSL on dark colours. 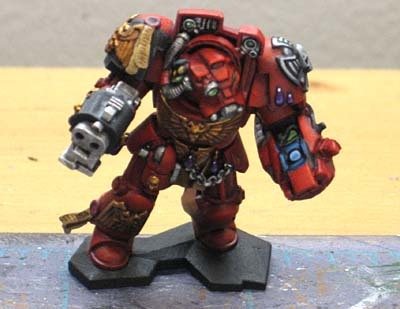 After I finish my Librarian I'm going for glowing powerfists of fury on all my tactical termis! Combat Apothecary: Good deal, make sure to post about it so we can see what you come up with. Thanks for that Ron, I was looking forward to seeing what you did with it. I'm glad I don't have to modify a whole lot about the hammers and will give you an update when my workspace is back in order and I get some painting done. I did the glowing plasma gun coils on my last Plaguemarine. I usually don't but it came out alright, though I think I'd use a smaller brush next time for the drybrushing to hopefully control more where the light falls. Kind of a general thing on the tutorials. It would be a lot of fun getting to see how people use the tutorials here and what their results are. I'd really like to see people send in links to their blog posts where they did follow a tutorial. Maybe something for the weekly FTW post? Jack: Excellent. You're right there with your model already. Just make sure you fill out your radius with the light and fade your edges and you'll be perfect. Muskie: Plasma guns can be tough for that very reason. You really do need to define all the thin coils on the gun to get the best effect in addition to getting the radiant light correct too. Flekkzo: Now there's an interesting idea. Let me see what I can do about getting some of those posted. Thanks Ron, thats a great help, really appreciate it. I'll pop some pics up as soon as I've had a chance to update it. Red: Looking forward to seeing more of your scorp's and hope the flood recovery is going well! Muskie: That orange glow looks great agains't the purple! Nice to see some plaguemarines that don't look like they just fell out of someones nose! Flekkzo: I did try and follow these tutorials when painting my chap, just wasn't getting it quite right! Hopefully on my next try I'll manage to to a step by step 'copying Ron' tutorial. Nice effect, thanks for sharing it. Now I just need to come up with some cool glowing gadget to try it on.